MainAll NewsInside IsraelTrump declared J'lm Israel's capital - but will Israel listen? Trump declared J'lm Israel's capital - but will Israel listen? While Trump announced plan to move embassy to J'lm, over 100 Israeli gov't offices remain in Tel Aviv, relying on waivers to delay move. 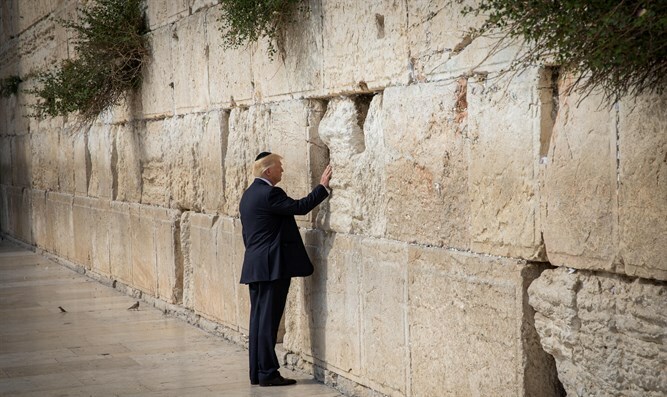 Last Wednesday, President Donald Trump formally recognized Jerusalem as Israel’s capital city, reversing decades of US policy vis-à-vis the holy city. The president also announced plans to relocate America’s embassy in Israel, currently located in Tel Aviv, to Jerusalem. The US embassy, which not only houses the offices of the US Ambassador to Israel but also employees some 1,000 personnel and provides a range of services including passport and visa processing and manages activities by US agencies in Israel, could take up to three or four years to relocate, experts say. In the meantime, President Trump renewed a waiver allowing the US embassy to remain in Tel Aviv. The waiver permits the president to defer implementation on the 1995 Jerusalem Embassy Act, which obligated then President Clinton to move the embassy to Jerusalem by 1999. Successive presidents have used the waiver to avoid implementing the law. With President Trump’s directive to the State Department, however, the US embassy is expected to be moved to Jerusalem by the end of 2021 or beginning of 2022. Following the announcement, Prime Minister Binyamin Netanyahu has lobbied other nations to recognize Jerusalem as Israel’s capital, meeting with French President Emmanuel Macron Sunday in Paris and EU foreign policy chief Federica Mogherini on Monday in Brussels. The Israeli premier noted that Jerusalem, the historic capital of the Jewish people, had served as the State of Israel’s capital since 1950, and was home to the Israeli parliament, supreme court, Prime Minister’s Office, and President’s Office. Yet the sudden about-face of US policy towards Jerusalem has also highlighted the fact that while the Israeli government’s primary bodies – the Knesset and the Supreme Court – are indeed located in Jerusalem, Israel itself has failed to move over a hundred major government offices which remain in Tel Aviv. When Israel declared independence in May 1948, Jerusalem remained under siege, necessitating the establishment of Tel Aviv as the country’s provisional capital. For two years, the Israeli Knesset met in Tel Aviv, before the parliament was moved to Jerusalem and the city declared Israel’s capital. Jerusalem, then a divided city, with the eastern portion occupied by the Jordanian army, remained a strategically sensitive area, and most of Israel’s government offices remained in Tel Aviv for decades. Along with most ministry offices, the Israeli military's headquarters, including the General Staff building, stayed in Tel Aviv, specifically in the Hakirya complex - where they remain to this day. Forty years after the Six Day War, however, the Israeli government resolved to finally transfer the remaining ministries and other government offices left in Tel Aviv to Jerusalem. A decade later, only 9 of the 140 government offices slated for relocation by 2015 had actually moved, Globes reported. While the government has pushed back the deadline by four years to 2019, a number of ministries have request waivers, allowing them to delay implementation of the government order even longer, including the Ministry for Development of the Negev and Galilee, and offices of the Education, Justice, Transportation, Internal Security, and Culture ministries. According to a 2016 report by Jerusalem Affairs Minister Zeev Elkin (Likud) to the Knesset, even if existing waivers were not extended again, the transfer of government ministry offices to the capital would not be completed before 2025 – a full decade after the original deadline, and years after the US embassy is moved to Jerusalem.